TDP-2 hits the headlines again! International power ecology company / News / TDP-2 hits the headlines again! The latest news on UTD-2 commissioning at Vyngapurovskoye oil-gas field of GAZPROM NEFT – NOYABRSKNEFTEGAS is being actively publicized in the media. Recently a unique facility developed by Russian inventors appeared here. 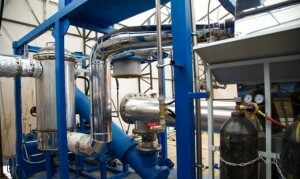 The function of the plant is based on the modern technology of dry pyrolysis. The oil sludge is heated by high temperatures in oxygen-free environment, and then it is decomposed into components – oil, water and solid particles (clay, sand, metal oxides). As it happens no harmful products of combustion is present to the atmosphere. …Oilers believe employment of such plant will significantly reduce the impact of oil extraction on the fragile northern environment. Information agency SeverPress (North Press) released a story about the plant manufactured for the processing of oil sludge and drill cuttings. Oil and Gas Information Agency covered the implementation of innovative technology of IPEC company.